Michoel Muchnik, a Lubavitch Chasid and artist, adds some color to one of his paintings. Michoel Muchnik's new gallery in the ground floor of his Brooklyn, N.Y., home resembles the interior of one of the Jerusalem stone houses from one of his many colorful landscape paintings. While the walls are at first close together, you descend a few stone steps and around a circular shape carved into the floor before entering the main gallery. Its rooms are small and intimate; the paintings compete for your attention. The walls offer alluring and bright images of Jewish life in general and of Chasidic life in particular; some of the paintings are adorned with antique jewelry, mosaics and enchanted objects that Muchnik has collected and then reinvented in his art. The artist hopes that his gallery, which opened just after the Hebrew month of Tishrei at 1406 Carroll Street in Brooklyn's Crown Heights section, will be a place not only for admirers to purchase his art, but where "people can come and enjoy the atmosphere." "It can be a quiet escape from the harried lifestyle of the city," says Muchnik. Many tour groups visiting the Chabad-Lubavitch enclave east of Prospect Park stop at the gallery. Muchnik officially requires appointments, but keeps his doors open for all. Muchnik, who grew up in Pennsylvania and embraced Chasidic life at age 20, has been painting since he was a teenager. At 18, he attended the Rhode Island School of Design and then went on to the Rabbinical College of America, a Chabad-Lubavitch yeshiva in Morristown, N.J., to immerse himself in Jewish studies. While there, he followed the instructions of the Lubavitcher Rebbe, Rabbi Menachem Mendel Schneerson, of righteous memory, to not interrupt his learning schedule by painting. He nevertheless managed to find time after classes to pursue his craft. Michoel Muchnik’s new "mosaic" style of art combines his painting with applications of tile pieces that he personally creates. You can't help but wonder where Muchnik draws inspiration for his paintings, not only on a concrete, imagery level, but on a spiritual level as well. Such imagination must have its roots from a deep source. Although humble about it and not quick to elaborate on his story, Muchnik relates that the Rebbe played a big role in perfecting his art, and soul for that matter, during his early days as a Lubavitcher Chasid living in Crown Heights in the 1970s. During his first yechidus, or private audience with the Rebbe at Lubavitch World Headquarters at 770 Eastern Parkway, Muchnik brought three samples of his art, which he says he absentmindedly left on the Rebbe's desk upon his exit. The Rebbe called him back and asked, "Are these for me?" remembers Muchnik, who answered, "If you would like." The Rebbe examined them carefully and pointed to a small colored drawing of a small synagogue in a Russian shtetl, saying, "I will keep this one." Muchnik took the other two with him, but as he started for the exit once more, the Rebbe called him back and asked if the drawing was an original. Muchnik confirmed that it was, and the Rebbe said, "I can't take an original. If you make a print of it, send me a copy." When he began making printed editions of his work at the Rebbe's suggestion, Muchnik sent one as a gift to the Rebbe. The Rebbe, though, suggested some changes to a few of the details. Following that exchange, Muchnik continued to send his art to the Rebbe for comments before printing. Today, the artist says that he noticed that many of the Rebbe's insights regarding his art reflected elements of his own life that required rearranging. "The picture was a reflection of myself," explains Muchnik. "I later realized the Rebbe was suggesting changing things of my neshamah, or soul, picture, not just artistic corrections." In one painting, the Rebbe instructed Muchnik to place an image representing gemilas chasodim, or good deeds, on the right; an image of prayer, representing avodah, or divine service, on the left; and matters reflecting Torah in the middle. Kabbalah and Chasidic thought teaches that these are the proper placement of such traits, with Torah in the center of one's life. Muchnik thought it "profound that these symbols should be in the right place," even in art, he says. In another instance, the Rebbe told Muchnik to add more depictions of Shabbos candles in a painting that featured many women. Muchnik’s art is all in the details. 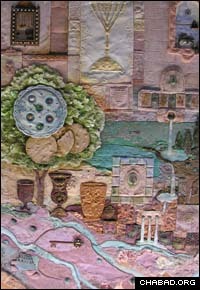 Here, one can find many different elements of the Pesach seder as well as symbols pertaining to other Jewish holidays. After printing each painting, Muchnik would put aside every 18th print – representing chai, the Hebrew word for life, which has a numerical value of 18 – for the Rebbe, a practice he continues even after the Rebbe's 1994 passing by sending them to the Rebbe's library. For his part, the Rebbe showed a lot of interest early on in Muchnik's work. When Muchnik displayed some pieces as part of a group show at the Brooklyn Museum of Art – just blocks away from the Rebbe's office – in 1977, the Rebbe told a group of French Lubavitchers who had just arrived in Crown Heights to attend the exhibit. Over the years, Muchnik would notify the Rebbe about his exhibits, and when the artist would travel internationally, the Rebbe would sometimes give him money in that country's currency to give to charity on his behalf. Muchnik's work from the 1970s was more "whimsical and playful," he says. "It had a childlike quality to it." Later on, the work took on a more poetic, lyrical tone. More recently, he's been developing bas-reliefs, including the grand piece gracing a second-floor wall at the Jewish Children's Museum in Crown Heights. The new gallery now offers Muchnik a chance to share his work with the community and visitors instead of traveling all over the world. 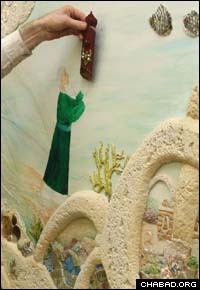 Today, he focuses on larger projects, such as mural pieces for Chabad centers, women's mikvahs and people's homes. Chasidic teachings play into the creative process; Muchnik is often inspired by a particular idea or parable that he explores artistically. Objects in his paintings play a key role, taking on a life of their own. Muchnik plays extensively with the Chasidic idea of bringing G‑dliness into the physical world. "Through objects, there's the use of parable," he explains. His painting of a jug with the Tomb of Rachel inside of it, for example, symbolizes the Land of Israel as a vessel for blessings. The art is "not too abstract," he says, "but it has an air of mystery to it." Often a work will "mean different things to different people," he continues. "When people are drawn to art, it makes their soul stir. By giving them something they haven't yet seen in Judaism, it's a window into a new aspect of Judaism."